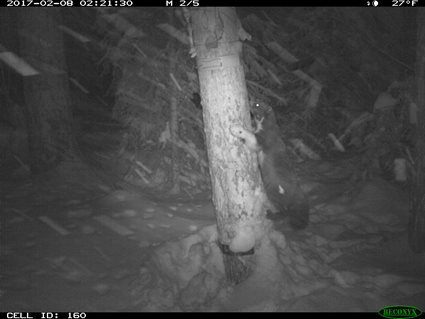 CHEYENNE - A team of Wyoming Game and Fish Department researchers recently detected two wolverines on trail cameras in northwestern Wyoming. These rare sightings are a significant boost to the three-year monitoring initiative studying wolverine distribution in the Bighorn Mountains and Greater Yellowstone Ecosystem. The wolverines’ images were captured earlier this year on trail cameras which are placed in remote locations and checked every month or two. Of the two wolverines spotted, one is well-known to researchers. The 11-year-old female was first collared as a juvenile in Montana. She was captured on a trail camera in Wyoming in 2014 and again, now in 2017. This female has very distinct markings which make her identifiable with good trail camera pictures. She has a white sock on her left arm with with a black dot on her left hand and a full white bib on her chest and belly. The other wolverine is an unknown adult. “These latest images build on our knowledge of wolverines in Wyoming, and the observations fall within expected wolverine habitat,” said Zack Walker, the Wyoming Game and Fish Department’s non-game bird and mammal supervisor. In late 2016, Game and Fish biologists and a team of volunteers placed trail cameras throughout the Bighorn Mountains and Greater Yellowstone Ecosystem. 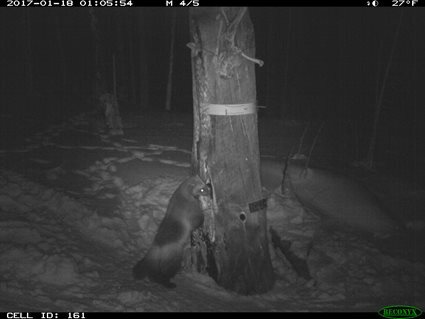 Trail cameras provide data on wolverine presence while wire brushes are designed to snag a few hairs from passing animals that can be used for DNA analysis. Wolverines live in habitats with limited amounts of food so individual animals require hundreds of square miles to live and reproduce. This means the number of animals living in a given area is extremely low. In Wyoming, wolverine habitat occurs at high elevations, often in designated wilderness areas. This rugged terrain can be challenging to access any time of the year, but particularly in winter. Monitoring of wolverines has occurred the last two winters in Wyoming by the Game and Fish with significant support from the U.S. Forest Service and volunteers. During the winter of 2015-2016, wolverines were detected in three of the 25 monitored cells. Game and Fish is surveying an additional 26 cells during the winter of 2016-2017. Funding for this three-year project was provided by the Wyoming State Legislature with project support from the Wolverine Initiative and the Eastern Shoshone and Northern Arapaho tribes. More information about wolverines and the study team’s efforts in Wyoming can be found on the Game and Fish website. CHEYENNE- Wyoming Game and Fish Department researchers are trekking into some of Wyoming’s most remote areas in search of the elusive wolverine. The study, part of a multistate and multiyear initiative, is focused on learning more about one of the Cowboy State’s rarely-sighted mammals. “This is the final year of our study, and we’re hoping to gather even more data about wolverines,” said Z ack Walker, the Wyoming Game and Fish Department’s non-game bird and mammal supervisor. A team of biologists are placing trail cameras in hopes of catching a glimpse of wolverines throughout the Bighorn Mountains and Greater Yellowstone Ecosystem. Trail cameras provide data on wolverine presence while wire brushes are designed to snag a few hairs from passing animals that can be used for DNA analysis. Wolverines live in habitats with limited amounts of food so individual animals require hundreds of square miles to live and reproduce. This means the number of animals living in a given area is extremely low. Monitoring of wolverines has occurred the last two winters in Wyoming by the Game and Fish Department with significant support from the U.S. Forest Service. During the winter of 2015-2016, wolverines have been detected in 3 of the 25 monitored cells. Game and Fish will survey an additional 26 cells during the winter of 2016-2017. “This project has already added significantly to our understanding of wolverine distribution in Wyoming. The detection of an individual in the Gros Ventre range is the first verified occurrence of a wolverine there,” said Lee Tafelmeyer, Game and Fish Wolverine Project Biologist. Funding for this three-year project was provided by the Wyoming State Legislature with project support from Wolverine Consulting and the Eastern Shoshone and Northern Arapaho tribes. More information about wolverines in Wyoming can be found on this page.